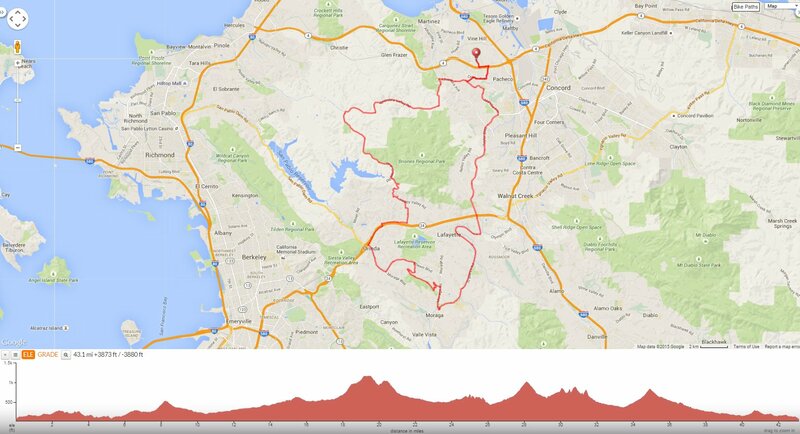 This semi-urban hilly ride goes up Donald Dr to Mulholland Ridge and drops down into Orinda for the run up Upper Happy Valley Rd to Happy Valley Rd. The route continues on Bear Creek Rd for the rolling climbs along the backside of Mama Bear. Take Alhambra Valley Rd for the climb up Pig Farm Hill before returning on Alhambra Ave and Vine Hill Way to Holiday Highlands. Exit Holiday Highlands Park and make our way up Arnold Dr to Glacier and Center Ave to Vine Hill Way. Morello Ave leads you out of Martinez into Pleasant Hill onto Taylor Blvd. Head south on Taylor Blvd; this busy main thoroughfare is a very utilitarian way to get from Pleasant Hill down into Lafayette with great pavement and wide shoulder areas. At Grayson Rd, Taylor Blvd gradually ascends with gentle grades of 3-5% before dropping down to the stop light at Withers Ave.
From Olympic Blvd, get onto the Lafayette/Moraga Regional Trail; this trail parallels St Mary’s Rd for 5.6 easy miles through Lafayette to Moraga Commons Park in Moraga. The Mulholland Ridge Trail gradually kicks back up to steep grades of 9-11% for the 0.4 mile up to the summit of Mulholland Hill at the Mulholland Reservoirs. Continue along Mulholland Ridge and descend Alice Dr to Zander Dr. The rolling terrain on Zander drops down onto Rheem Blvd to Glorietta Blvd. Moraga Way takes you through Orinda to Theatre Square. Go around the traffic circle and follow Bryant Way to the St Stephens Trail; this trail runs parallel to Hwy 24 for one mile and exits onto the freeway overpass on St Stephens Dr. El Nido Ranch Rd drops down to Upper Happy Valley Rd into Lafayette. Happy Valley Rd continues to climb for another mile up to the summit near Orinda View Rd with gradient ranges of 9-11%! The twisty bumpy descent on Happy Valley Rd drops onto Bear Creek Rd. Head north on Bear Creek Rd through Briones Hills for the series of small climbs and descents over the backside of Mama Bear. It’s 1.5 miles with gradient ranges of 5-9% up to the Lawson Hill summit. Alhambra Valley Rd east begins with a gradual climb up along the valley vineyard with the olive grove and animal farm. The road continues through the valley and ranchlands of JMB ranch to the base of Pig Farm Hill. East Pig Farm Hill quickly winds down around the canyon to the valley out to the junction at Reliez Valley Rd-stay on Alhambra Valley to Alhambra Ave.
Mulholland Ridge is one of my favorite local places to ride out to-it’s never crowded and the views are spectacular! Hit the city roads and enjoy it for yourself! Next Post → Happy Birthday Ann!